IOFAMP, International Organization for Fisheries, Aquaculture and Other Marine Proteins, with an international and integrator scope in all matters related to fisheries, aquaculture and other port operations. Its mission focuses on simplifying fishing ports management and internationally protect an industry that affects people, marine resources and their biodiversity. We were challenged to create a coherent branding, respectful of every culture and nationality around the world, and also represent its philosophy: Globality and the union among marine resources and their biodiversity. Not easy at all! A big storm to weather! And so, we grabbed the helm and sailed in full swing towards calm waters. 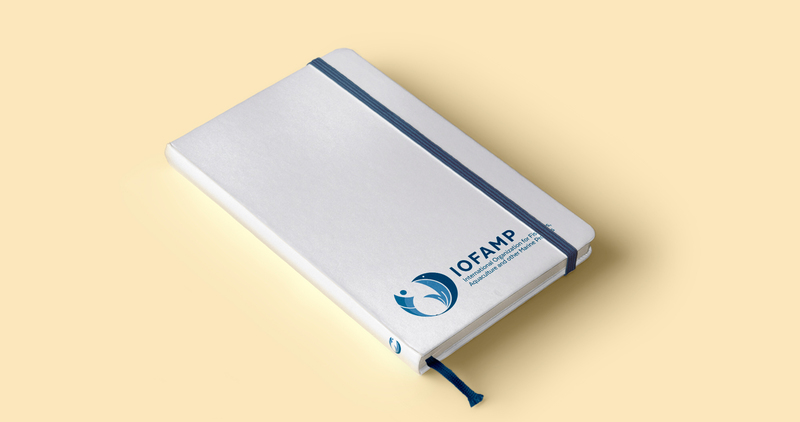 With the marine commitment as a base, we steered the boat towards the creation of the website and corporate identity of IOFAMP. The docked in a logotype design that combines and integrates the key concepts of the organization: the earth, the human being, the marine environment and the fishing industry. Because of its global reach and to avoid aby cultural conflicts or unwanted connotations, we used blue as the branding's main colour, a shade that, of course, represents the sea. The typography, sans serif, provides to the brand with trust, earnest and professionalism, values to really take into account for this project. We also took charge of translating the visual identity into different media: From the decoration of the head quarters to the stationery pieces. We designed a very clean and simple website, with the most relevant information. A brief presentation of the company’s organization, visually compelling and with precise texts, resulting in an easy navigation journey for the user. A branding and web project that reaches port surrounded by homogeneity and a calm sea.